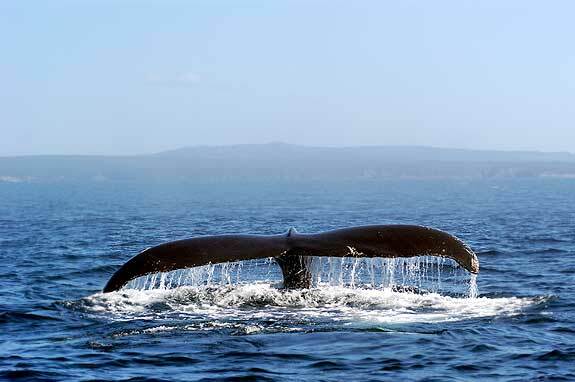 Tail fluke of a Humpback whale off the Maine coast. Why is it that we are so fascinated by whales? Is it because we recognize a like intelligence, a similar caring for young and family? Maine’s craggy coastline is the perfect place to indulge that fascination. It is sometimes possible to see a breaching whale, an errant flipper or a water spout from shore. But your chances of seeing whales increase dramatically when you take a Maine whale watching tour out into the Gulf of Maine and beyond. We fish the Gulf of Maine because it is rich in marine life. So do the whales. The humpbacks, distinguished by their dorsal hump and patterned tail flukes, arrive every spring after spending the breeding season off Florida and the Antilles. While these southern seas provide a warm, more protected environment for the birthing and caring of young, there is little for the whales to eat. When they arrive in Maine, they are hungry. If you are lucky you’ll be able to see them feed. It is a group effort, done by a combination of “fish herding” and bubbles used as a screen. The part you might see is when they break the surface with their giant mouths scooping up hundreds of gallons of water along with the unlucky fish. The finback whale is also migratory. At an average of 78 feet, the finback is second only to the blue whale in size. They are usually solitary, but in the Gulf of Maine it is possible to see several working together to catch fish, much like the humpbacks. Also like their smaller cousins, finback whales have no teeth. The enormous quantities of water they take in are filtered by baleen, separating the small fish, squid, crustaceans and krill. The seawater goes back into the ocean and one big swallow takes care of the rest. Other cetaceans commonly found off the coast of Maine include the minke, pilot whales, the white-sided dolphins and harbor porpoises. Occasionally a pod of killer whales, or orcas, will visit. These black and white tuxedoed creatures swim in sync, their black dorsal fins bobbing up and down creating a sort of nautical ballet. Seals are also plentiful and it is amusing to watch their antics. A Maine whale watching cruise can be anything from a half-day out on the water to a six day live-aboard adventure out of Belfast that includes a visit to Sable Island or Nova Scotia’s Gully Marine Reserve. Day cruises out of Lubec take you to the Bay of Fundy, Passamaquoddy Bay and Cobscook in search of not only whales, but eagles, osprey and other shorebirds. Sailings out of Milbridge often include visits to Petit Manan Island, famed for its lighthouse, the second tallest in Maine, and it population of nesting puffins, terns and sea ducks. 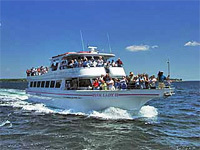 Some Maine whale watching tours out of Saco cruise the Saco River, home to harbor seals and porpoise, and out to Tanta’s Ledge to find an assortment of whales, sharks and the Volkswagen-sized sunfish. Other departure points include Boothbay Harbor, Rockland, Bar Harbor, Camden and Machias. Group and private cruises are offered. Whale watching trips take you out on the open ocean, and safety is your best friend. Everyone on board wears a life jacket, no exceptions. Bring warm clothing, even in the summer because the sea air can cool things off quickly. Take a hat and sunscreen, sunlight reflected off the water is more intense. Snacks and drinks are usually available on board, but it’s best to check. If you have a problem with motion sickness, you might want to check with your doctor before travel about something that can help. Taking a whale watching tour on a larger vessel might also help with this issue. If the water is too rough or weather conditions unsafe, the captain may opt to reschedule your trip. Don’t forget your camera, video equipment and binoculars so you can brag about your trip when you get home. Most importantly, bring along a sense of wonder, because if you are lucky enough to gaze into the eye of a whale, you’ll never be the same. 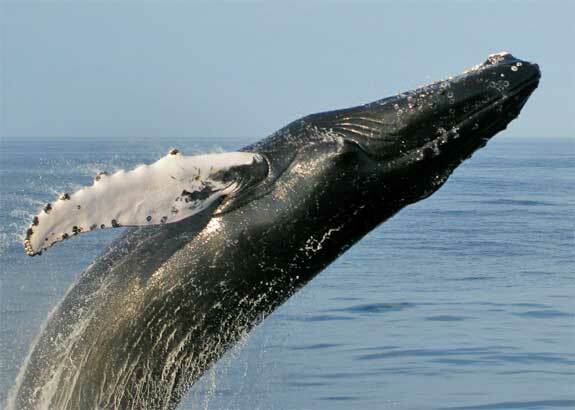 Humpback Whale breaches off of Bar Harbor, Maine.